What's The Bzz? Children's Claritin Grape Chewables, that's what! Did you know? Every year, two million school days are lost due to seasonal and indoor allergies. And 4 out of 10 school children are affected by allergies. It doesn't have to be that way. Non-drowsy antihistamines like Children's Claritin Grape Chewables can help provide all-day relief from runny noses, itchy, watery eyes, and other allergy symptoms. Children's Claritin is the only over-the-counter children's brand that provides powerful all-day relief for a child's worst indoor and outdoor allergy symptoms, without making him jittery or drowsy (among leading OTC brands). And, it's teh #1 pediatrician recommended non-drowsy brand. So, with Children's Claritin Grape Chewables, you can help kids focus on being kids, not on their allergies. Grape chewables are safe and effective for kids 2 and up (when used as directed) and they have a great grape taste that will go down without a fuss. Claritin products also come in two other forms that are great for kids, so parents can choose what works best for each child: a syrup for kids as young as two, or fast-dissolving, hassle0free RediTabs for children ages 6 and up. When children aren't suffering from allergies, they can focus on school, sports, friends, games, hobbies, and other "kid-stuff" all day long. Is it a cold or an allergy? 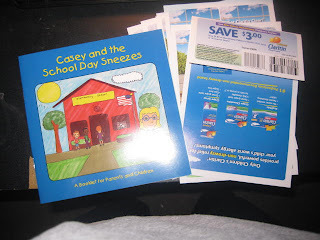 Would you like to win a box of Children's Claritin Grape Chewables, a book called "Casey and the School Day Sneezes" to help your child understand what allergies are, as well as a coupon for $3 off of your next purchase of Children's Claritin? Leave a comment on how you currently handle your children's allergies. This giveaway is open to all US residents and will end on 5/27/09 at midnight. While you're at Claritin's Website, read the All About Allergies section. *I'm a BzzAgent, and was sent these items to Spread the Word. I love the children's Claritin. My nephews don't think it tastes too bad and they really seem to work. I bought my daughter a air purifier for her room and use a air tight cover for her mattress and pillow. Sadly we stay inside when allergies get the best of us. I currently use Little Allergies Allergen Block! I'm sad to say this since your giving away claritin, but we use zyrtec. I'd love to try claritin though! Thanks for the chance! Every Friday, I will have a weekly Giveaways Galore post that you can link up to via Mr. Linky!! We use the claritin liquid but I would love to try the chewables! Thanks! We use the Children's claritin for my youngest son. I also have to keep the AC on all the time... no open windows here. My son gets nasal spray, eye drops, and 2 doses of allegra daily...my oldest daughter takes Claritin once a day!